The Northwestern Center for Engineering Education Research (NCEER) is the umbrella organization for engineering education research at Northwestern University. NCEER's mission is to spark engineering education within Northwestern and beyond. Created in 2007, NCEER provides the necessary organizational infrastructure required to nurture collaboration and promote research in a deeply interdisciplinary environment. The Center makes connections among many partners, provides guidance and support for research projects, and facilitates collaborations with faculty at the School of Education and Social Policy and the Searle Center for Advancing Teaching and Learning. 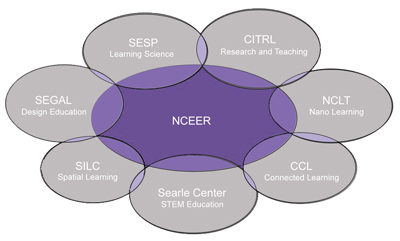 NCEER also draws its scholars from the Segal Design Institute and several NSF-funded projects, including the Center for the Integration of Research, Teaching and Learning (CIRTL), the National Center for Nanotechnology Learning and Teaching, the Center for Connected Learning, and the Spatial Intelligence and Learning Center, all of which have major branches at Northwestern. NCEER also serves as a hub for disseminating research and forging relationships within the engineering school, across schools at Northwestern, and with other universities that have similar aims. Engineering education research requires the unusual combination of actively engaged engineering faculty and learning science methods, including quasi-experimental design and qualitative and quantitative methods. NCEER is building a community of interdisciplinary experts whose research aims to reform engineering education and is promoting awareness of this work within Northwestern Engineering. NCEER succeeds several individual engineering education research efforts at Northwestern, including the only NSF Engineering Research Center (ERC) ever dedicated to education: the VaNTH ERC for Bioengineering Educational Technologies. Such precedents have enabled NCEER to become one of a mere few organizations nationally that is able to consistently pursue this new kind of engineering education research.